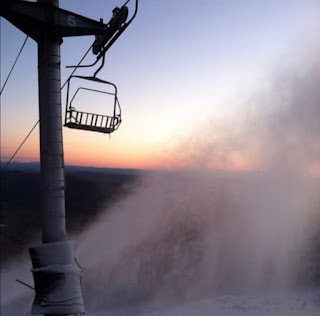 Killington: First Run Down Skye Lark for the Season!! I don't know about other ski areas, but Killington has this wonderful tradition of mowing the grasses on the more predominant and wide trails. This creates a wonderfully gushy cushion of hay on which the snowmakers can easily blow snow. A true natural base, if you like. The hay bends to cover some of the gnarlier rocks, something greatfully appreciated as we reach the sketchier phases of the season. It's Time to Take some Runs!! This isn't normal trail running - still a great way to make a pleasurable ascent in the early early mornings - this is ski trail running. Sounds like a PSIA manual. Checking out the trail work. the bits and pieces of regrading. the snowmaking pipes that have been cleaned up. My ski season has started. I don't think I could have gone too much longer without feeling the variances of the mountain beneath me. and technically there is actually so snow or skis. I am going downhill at angles. I am earning my turns. You even get to dive into the woods for a few extra cautious turns in the moss covered rocks and fallen branches. Foot placement becomes wicked important here. Have you ever gotten your foot stuck amongst down trees up to your knee? It's a real harsh reminder to look ahead! Vespi always thinks it's pretty funny though. And greets me with a big lick across the cheek. And what is the reward for all this? Is it that all my hard work will pay off when winter comes? 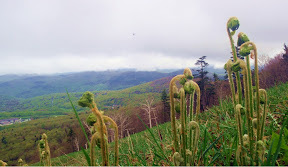 or is it getting to take in the beauty of the green mountains from places we only see tradtionally in the winter? perhaps the knowledge gained of the terrain underfoot and exploring the multitude of secret trails that are sprinkled over our mountain? the quality time with the puppy? or is it the pure joy of feeling the wind in my hair as I cut turns down the mountain?